Here is a brand new screenshot that contains some new gameplay relevant changes! First of all we have updated the HUD to give players some more information. The date format now includes the month written as opposed to a number. The arcade’s monthly expenses have now been added below your current cash total so you can budget appropriately. In addition to this, there is a new machine type we are working on. These are the ones on the back wall which we call “Sweet” machines. They are purchased from an import machine salesman who visits your arcade from time to time. These machines are hard to come by and take up two spaces in your space due to the requirement of the chair infront of them. 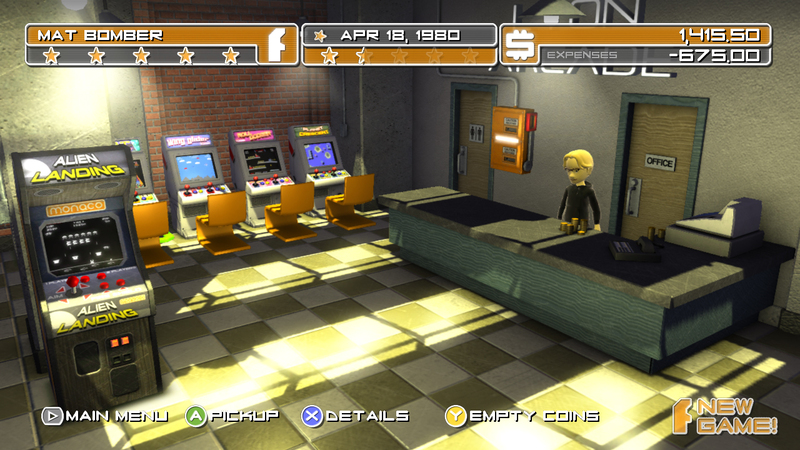 We also been hard at work modifying the current arcade machines textures to fit in less memory. The Alien Landing machine has been built with this spec. It uses a few dozen less polygons and some smaller textures but the visual result is barely noticable. In fact the cabinet itself is more detailed than it was before due to more efficient UV unwrapping and mapping. Finally there is another new game mechanic you can see in the shot. If you look behind the arcade owner you can see there is now a large orange power box on the wall. Much like in an RTS you have to make sure you can supply what you own. Upgrading your power box, at a significant cost, allows you to put more arcade machines on the floor. Thanks for checking it out! We will be updating everyone on the state of the game and when you can expect to play it soon!